Common Name: Coix seed, Job's tears seed. Part Used & Method for Pharmaceutical Preparations: The seeds are obtained by removing the hard husk of the fruit, which is gathered in autumn. Meridians: Spleen, stomach and lung. 1. Deficiency of spleen manifested as edema, dysuria and diarrhea. 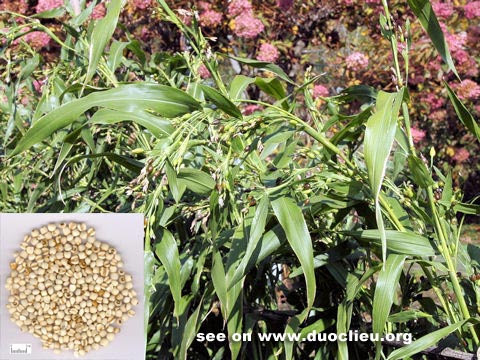 Coix seed (Yiyiren) is used with Alismatis rhizome (Zexie) and White atractylodes (Baizhu). 2. Beginning stage of damp-heat febrile diseases when the pathogenic factor is at the qi level. Coix seed (Yiyiren) is used with Talc (Huashi), Bamboo leaf (Zhuye) and Rice paper pith (Tongcao) in the formula Sanren Tang. 3. Accumulation of damp-heat or stagnation of qi and blood manifested as lung abscess and intestinal abscess. Coix seed (Yiyiren), Reed stem (Weijing), Benincasa seed (Dongguaren) and Peach seed (Taoren) in the formula Qianjin Weijing Tang is used for lung abscess with cough, sputum and pus. Coix seed (Yiyiren) and Patrinia herb (Baijiangcao) in the formula Yiyi Fuzi Baijiang San is used for intestinal abscess. Caution & Contraindications: To tonify and strengthen the spleen, this herb is dry-fried.